A good web browser should offer options to import and export passwords, browsing history, bookmarks, and other data. Import and export options make backing up data easy and more importantly, it’s a must for users who often switch between web browsers. 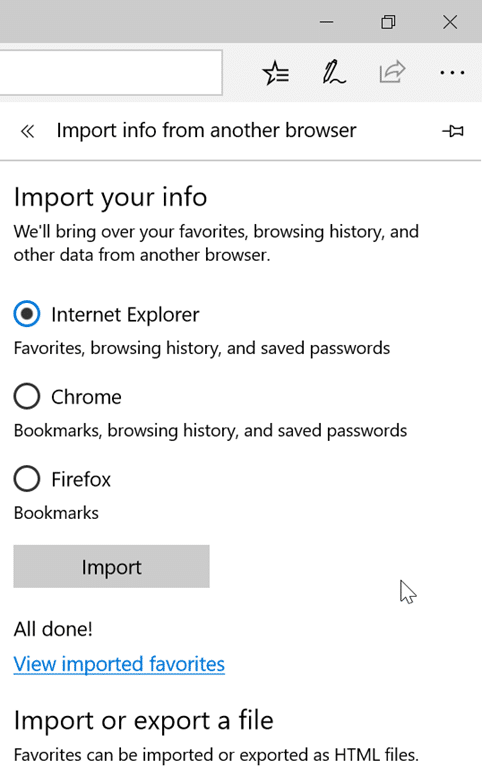 The initial version of Microsoft Edge included in Windows 10 (build 10240) didn’t support importing and exporting passwords. In fact, up until some time ago, it was not possible to import passwords from other web browsers. Thankfully, Microsoft is slowly but surely adding new capabilities to Edge. The Edge browser now supports importing passwords from Google Chrome as well as its own Internet Explorer. With the support for two popular browsers, Microsoft is now hoping to attract some hard-core Chrome users to its brand new web browser for Windows 10. 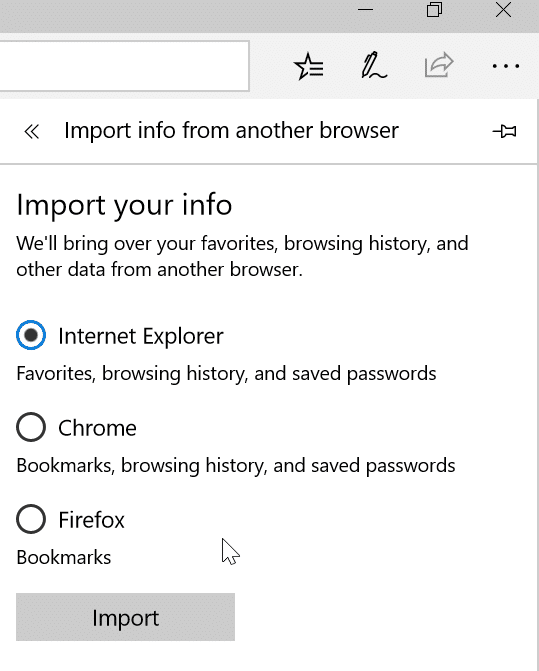 In addition to passwords, the import feature imports bookmarks and browsing history from your Internet Explorer browser to Edge. While importing passwords, you cannot configure Edge to import only passwords leaving behind history and bookmarks. This is the only drawback of the import feature. Anyways, if you want to import Internet Explorer passwords to Edge browser, here is how to do just that. 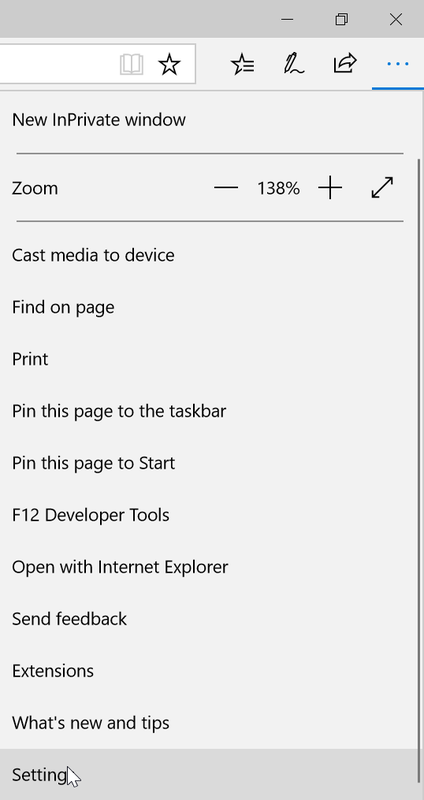 Step 1: Close Internet Explorer browser, if it’s running. Launch Microsoft Edge. If Edge fails to start, simply repair Edge browser. Step 2: Click the three dots and then click Settings. As you can see in the picture below, the three dots icon appear just below the close button. Step 3: Under Import favorites and other info section, click Import from another browser button. 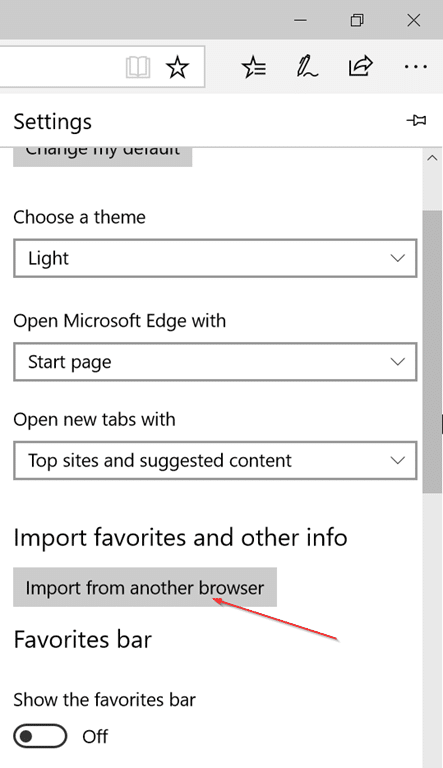 Step 4: Select Internet Explorer, and then click Import button. The Edge browser will start importing all passwords, bookmarks, and history saved in your Internet Explorer browser. Once the import is done, you will see “All done” message. The process hardly takes a couple of seconds. You might also like to know how to change the default download location of Microsoft Edge browser.